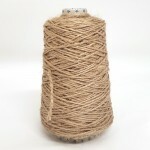 200g cone of natural jute yarn. 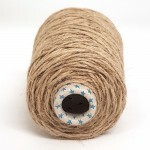 A strong, smooth yarn with a slightly hairy, string like texture. It's a versatile yarn with a rustic look and great for re-enactment work. 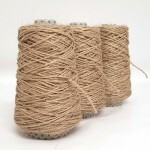 200g cones of very strong, natural coloured, undyed pure jute yarn. 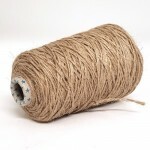 Jute is a naturally very strong yarn in one nice, thick weight which a neutral undyed beigey shade. With a slightly hairy, coarse finish it is a rustic style yarn used for a whole host of textile crafts and especially useful for re-enactment projects. Jute is ideal for a whole host of different crafts requiring a strong, smooth yarn with a slightly hairy, string like texture&excl; Every project using jute will be given a rustic feel making it ideal for many "vintage" or "boho" effects. It&apos;s strength means it&apos;s perfect for weaving on all types of looms - use as the warp for rugs, and make your own doormats, runners and floor rugs by using in both the warp and weft. Brilliant for strong braids, cords, ropes and decorative tassels. The revival of macrame also makes it ideal for a wide range of knotting crafts from hangers to hammocks. Knitters or crocheters can create hard-wearing bags, mats, table mats, coasters or even a summery brimmed hat. It is the perfect yarn for crocheting into baskets, bowls and boxes to use around the house as the combination of the crocheted stitch and the tough yarn creates a sturdy, non-floppy shape. 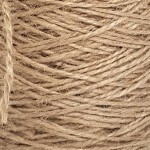 Of course jute is great as a general "string" around the house or garden, from tying up brown paper parcels to sweet peas, though please be aware that long exposure to the sun of any natural yarn can eventually lead to discolouration and weakening. The yarn can be dyed to heathery, muted shades due to the base colour having a brown cast. Use cold water dyes or natural dyes for authentic coloured yarns - perfect for re-enactment projects. A regular, repeatable yarn that's hugely versatile and a great price.